Who can come up with the funniest (Peace Corps related) caption or headline for this photo? Click the links for more cartoons, more funnies, and more current events funnies. "I just hope the Florida ballot count picks up the votes of active Peace Corps Volunteers." "Sir, I can understand your positive feelings because of my speech here tonight, but I don't carry Peace Corps applications with me." I'll never forget my first meeting with a Peace Corps Volunteer while traveling in Africa. He taught me that, in US vernacular, "Shove It" means "I'm sorry we disagree but I respect your right to have a different perspective". It's a wonderfully idealistic way to end a conversation but John assured me it would not be an appropriate way to end this speach. Is that Dan Quayle in the audience? No I was never a Peace Corps Volunteer. You say you ALL want to volunteer RIGHT NOW? How about waiting until my speech is over? "Will everyone from Mozambique please raise his hand." Mrs. Ketchup proves she can pour it on. Yoo Hoo -- Ms. Heinz Kerry... If I vote for John, will he convert ketchup back into a vegetable again? We were warned that life in the US is a little faster, but it does take getting used to. "Don't cry for me, Massachusetts"
".... and furthermore, let me warn of the dangers of ingesting Mozambiquen mushrooms." 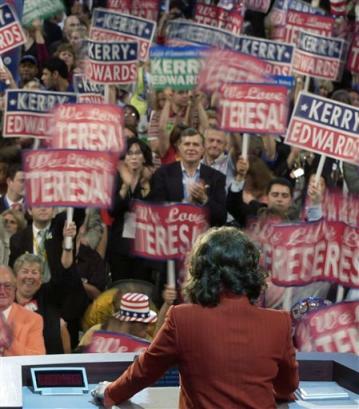 ...and I'd like to thank Teddy Kennedy for hand-painting many of the "Teresa" signs you are holding tonight. I know my husband is behind in the polls, but with yours and my help I am sure we can somehow catsup. Teresa! The mother of all of all candidates!